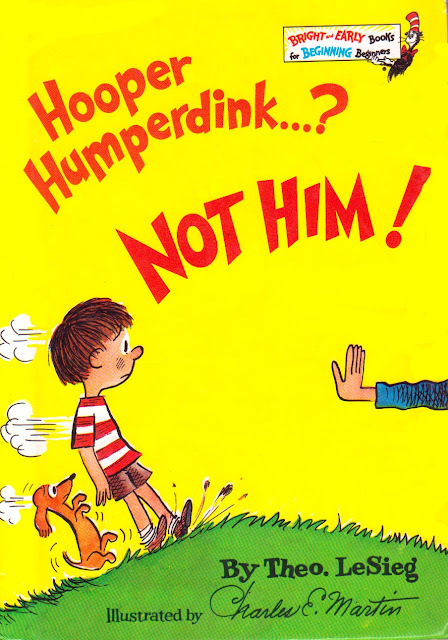 Vintage Kids' Books My Kid Loves: Hooper Humperdink...? Not Him! I can only imagine Dr. Seuss sitting down to write this book, perhaps based on a funny name he made up or heard and trying to think of all the rhyming names and laughing at the little boy Hooper who no one wants at a party. It probably tickled him to no end. Every child had someone like this in their class... and some of us were probably the kid who didn't get invited. In a wildly exaggerated tale as to who should be invited before HH, the drawings are a party unto themselves... leaving little to the imagination yet feeding it completely. I'll ask the Simpson sisters, too. But I'm not asking YOU KNOW WHO! Nobody wants to play with Hooper. 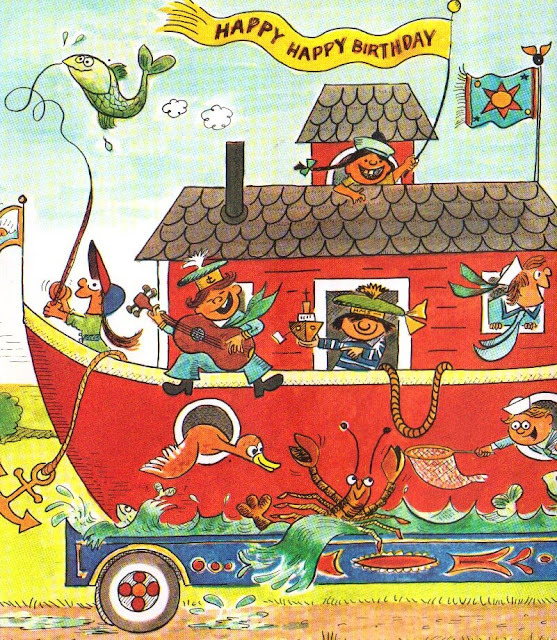 Of course, all ends well, because good little children always include everyone at their birthday parties, no? Nobody wants to be the kid who gets left out. Speaking of, recently I've heard some of my friends mention the birthday age rule... meaning if your child is turning six, then you should only invite six friends to the party. Somehow that doesn't work into the nobody getting left out equation, but I guess I'll worry about that later when the boy actually wants to start excluding. Yuck! I know, it does seem weird to reissue with new illustrations when the old ones are perfectly cute. I went to a Scott Nash reading of the reissued book, and he said he based Hooper Humperdink on Adrian Brody, and now I can't look at it without just seeing Adrian Brody. Though I had also just had a baby, who took us five days to name, and I was sorely wishing we'd had Hooper Humperdink, in any form, to give us more name ideas while we were making our lists in the hospital room. I don't know why they reissue, but I know Scott Nash has done two: this one and Flat Stanley. When they redid Flat Stanley, they changed it from a picture book format to a chapter book, and also added more "Stanley" adventures. As well as changed the fact that Stanley sips milk from a silver cigarette case while he's being mailed cross country (since kids in 2006 probably don't know what a cigarette case is). 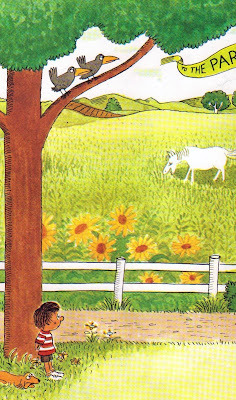 Books by Theo LeSieg are a great favorite at our house with kids young and old, even the adult kids.